The Fountain of Neptune that has been standing in the Długi Targ for 350 years and the Crane are the most widely recognized symbols of Gdańsk where people queue every day to take photos. Abraham van den Blocke was the author of the fountain’s design and stonework while the Neptune was supposed to refer to Gdańsk links to the sea. The Fountain was cast in 1615 at the initiative of the then city mayor, Bartłomiej Schachmann. The fountain was saved from destruction during the WWII because its individual fragments were hidden out of Gdańsk. In 1954, the Fountain of Neptune returned to Długi Targ to the delight of tourists and inhabitants of Gdańsk. 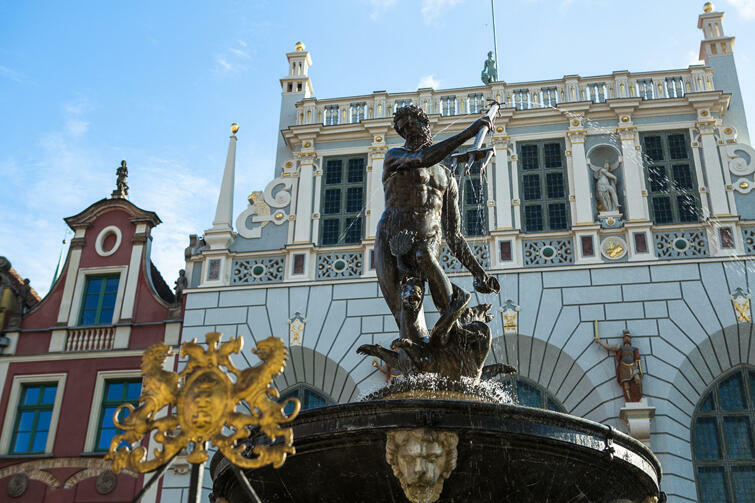 A Gdańsk legend about the famous Goldwasser tincture related to the fountain is worth mentioning here. According to that legend, Neptune was so outraged because of the coins thrown into the fountain that he hit the water with his trident breaking the coins into tiny gold flakes that, as of that time, adorned the herbal tincture with their glitter. Goldwasser has been one of the most popular liquors in the nearby restaurants to this day.